The customer, situated in South-west Cornwall, was undertaking a large refurbishment of their rural, countryside home and part of the project was to upgrade and modernise their heating system. Initially enquiring about the suitability of ground source heat pumps, an air source solution was proposed. Air source offered the customer similar benefit but with less disruption. The air source system installed cover 100% of the property’s space heating and hot water demand. There is no need for any backup. Replacing their existing night stores with an air source heat pump provides the Helston-based customer with numerous benefits. The Renewable Heat Incentive – in order to reduce the UK’s carbon output, renewable heating is subsidised. Our Helston-based customer will earn £1270 in annual RHI payment in the first year. This figure will increase with inflation. 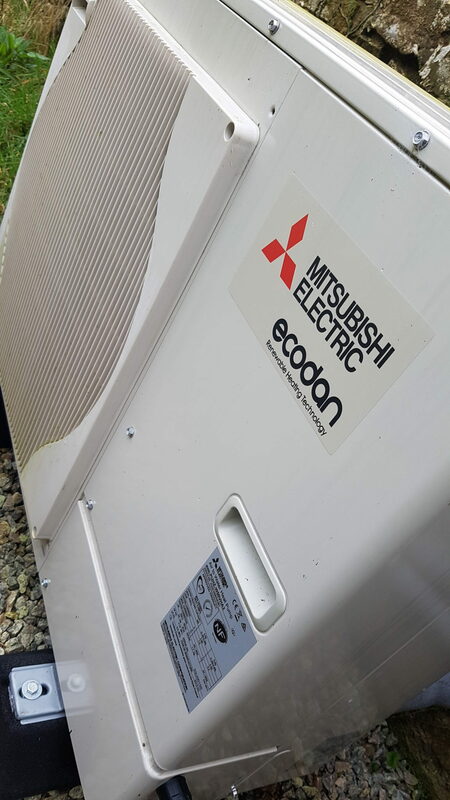 Energy Savings – by replacing their expensive-to-run night storage heaters with an energy friendly heat pump sees the property’s energy bills reduced by £550 a year. Carbon Reduction – swapping heat demand from night storage heaters to an energy-friendly heat pump will see a carbon reduction of 5.3 tonnes each year. Find further information on the benefits of air source heating here. As a result of the RHI payments and energy savings from this air source installation, this system provides a return on investment inside five years.